ella was born in what is now slovakia in 1882. she came on a ship to the united states by herself at the age of 15. she married, had 2 children, got divorced in the early 1930s, moved to california and lived until the age of 89. somewhere in between all this, she went to glacier national park and posed for a photograph with some indian men in front of their teepees. 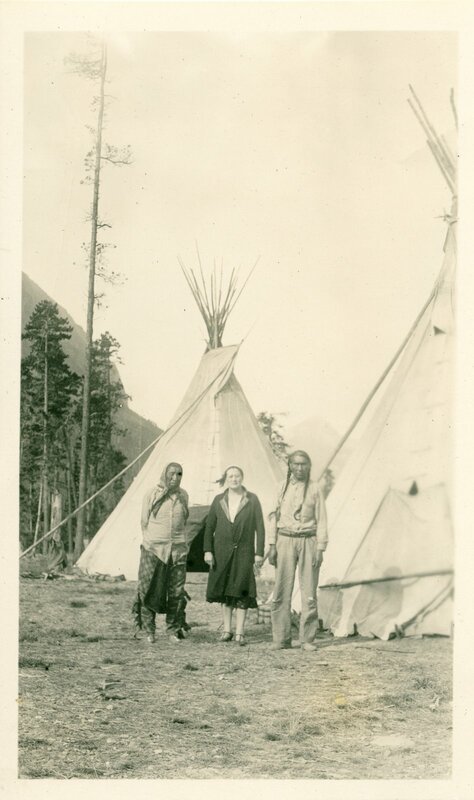 now, i didn’t know nana ella, my great-great-grandmother, but this – glacier national park, teepees, indians – is not something i would have guessed she did. and, in fact, the entire idea of this picture continually amazes me. on second thought, though, i don’t know why this is really particularly surprising. nana was not a boring person, though apparently she was obsessive-compulsive about things like mopping floors. my great-aunt francine tells stories about nana taking her to multiple double features in one day and pursuading her, as a newlywed, to paint a wall in her first apartment purple. these are stories that don’t get told about uninteresting people, people who you would never suspect of taking a trip anywhere. there is not even anything really that surprising about a 49 year old lady visiting glacier national park and having her picture taken there in 1931. the many glaciers hotel, which the caption on the back of this photograph mentions, still exists. a hotel in the best tradition of grand old national park hotels, it was (is) part of a string of hotels and chalets built across the park in the 1910s, something that wouldn’t be out of the question for a 49 year old lady from chicago to visit, even during the depression. in fact, it was probably something pretty fashionable to do, and if nana cared about anything, she cared about fashion and class. then there are the indians. it isn’t hard to imagine an encampment of teepees and indians standing by near the hotels for photo opportunties with idle visitors from the east (and i’m hoping, a sizable tip from ladies like nana). today, even just teepees (and a chuckwagon breakfast) at dornans in grand teton national park draw a crowd fascinated with the notion of the west. but still. somehow, even though i know these things, nana and the indians never fail to, for lack of better words, completely blow my mind. it looks like that indian is missing an eye. I am impressed that she was divorced in the 30s. Impressive lady, no doubt. it does, doesn’t it? i think it’s just a piece of dust or something that’s printed on the original, because when i blew it up really big, it wasn’t quite eyepatch-shaped.the divorce is a whole other story for another time. a family tragedy, in a way. but that will have to wait until i figure out what picture would go with the story best. I love the picture and the story that you created as background. You seem to capture the interesting and eccentric side of my great-grandmother too! thanks, dad. she was definitely a ballsy lady if nothing else, i must say. story about a fashionable and eccentric family member. i am really digging this blog, rebecca ann. in some ways, it is a common image, something i have seen before, a part of the “wild west” experience. photographs with the locals, appropriation of culture, commerce at the foot of the black hills. it is still happening over 70 years later.